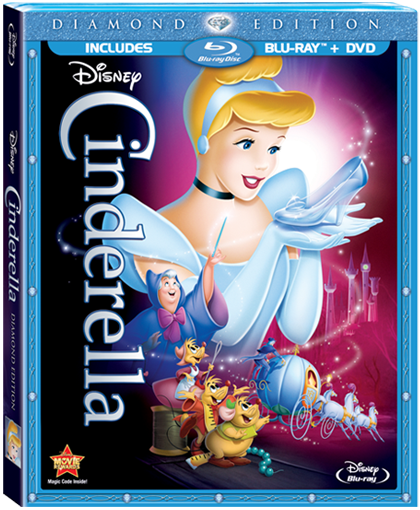 “A Dream Is a Wish Your Heart Makes,” and at the stroke of midnight, October 2, 2012, dreams around the globe really will came true when The Walt Disney Studios opened its prestigious vault to release one of Walt Disney’s most timeless and beloved masterpieces of all time, “Cinderella,” in the highly anticipated Blu-ray™ Diamond Edition Collection. This is one of my all time favorite Disney movies and to see it on blu-ray was absolutely wonderful. My daughter and I both sat down and watched this last week and we had so much fun. The quality of this movie was phenomenal and it looked as though this was an entire new movie. We loved that this also came with an alternate never before seen opening, that was fantastic. Not only did we enjoy this movie in a whole new light, but we loved the extra bonus features as well. We got to see Tangled Ever After, which we hadn't seen yet. We loved it. I also got to add the extra games and activities to my iphone, which is awesome and something that will definitely come in handy to keep my little ones occupied. This newly version of the classic tale is a must have in your Disney movie collections before it returns to the vault! Disclosure: All opinions are my own. I received Cinderella at no cost for the purpose of this review. No other compensation was received.